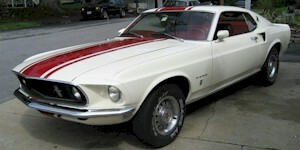 Ford could not export the Mustang to Germany, but they could export a Mustang with it's emblems replaced with "T-5". The T-5 Ford was available for export to Germany from 1964 to 1979. This is unrestored Black Jade 1969 T-5 fastback. Ford couldn't export Mustangs to Germany. They had to be re-badged as T-5s in order to be exported to Germany. US Military stationed in Germany purchased most of the T-5s. This one has a Nugget Gold knit/vinyl interior. Other factory options include, 351ci 2-barrel V8, automatic transmission, console, power steering, power disc brakes, air conditioning, AM radio with the Stereosonic tape system, head restraints, and Argent styled steel wheels.